As a proud real estate professional, there is no more exciting time for me than when Cityscape Global opens its doors in Dubai and showcases to the world what a fantastic industry we have. And that time is rapidly approaching – Cityscape Global is just around the corner and this year’s edition will be as exciting and informative as those in years past. For buyers and investors, there is no better place to gain an appreciation of the myriad opportunities on offer. I always advise my clients that the best way to get the most out of the event is to canvas all the interesting opportunities on display and gradually yet efficiently establish a shortlist of the best opportunities. Establishing such a list from an exhibition as huge as Cityscape is not easy and requires a disciplined approach. This is where a property asset management professional can assist and it’s a role that keeps me extremely busy with my clients over the entire period that Cityscape is open and for some weeks subsequent to its conclusion. 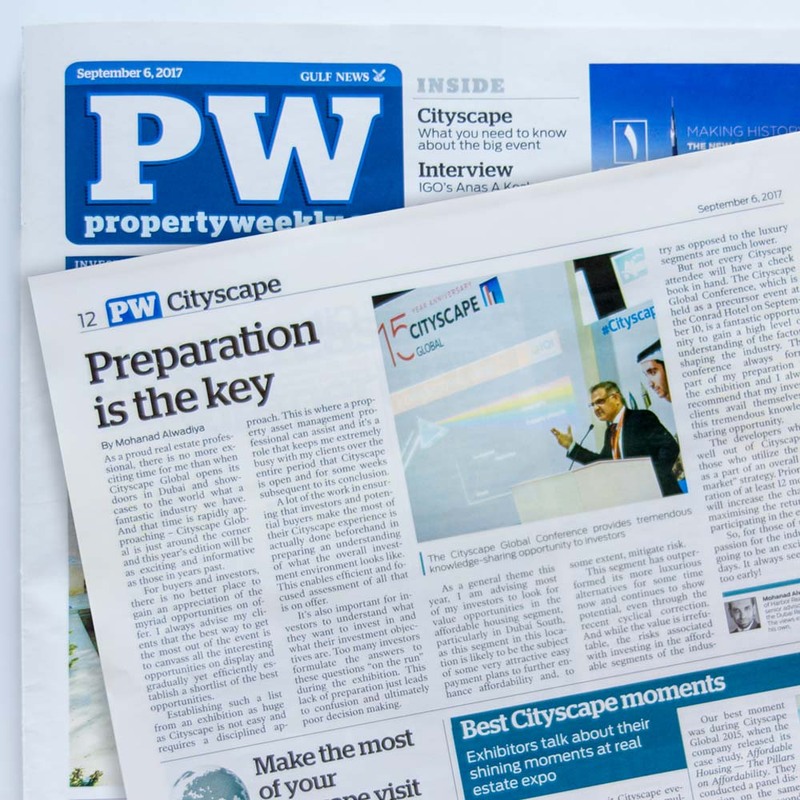 A lot of the work in ensuring that investors and potential buyers make the most of their Cityscape experience is actually done beforehand in preparing an understanding of what the overall investment environment looks like. This enables efficient and focused assessment of all that is on offer. It’s also important for investors to understand what they want to invest in and what their investment objectives are. Too many investors formulate the answers to these questions “on the run” during the exhibition. This lack of preparation just leads to confusion and ultimately poor decision-making. As a general theme this year, I am advising most of my investors to look for value opportunities in the affordable housing segment, particularly in Dubai South, as this segment in this location is likely to be the subject of some very attractive easy payment plans to further enhance affordability and, to some extent, mitigate risk. This segment has outperformed its more luxurious alternatives for some time now and continues to show potential, even through the recent cyclical correction. And while the value is irrefutable, the risks associated with investing in the afford-able segments of the industry as opposed to the luxury segments are much lower. But not every Cityscape attendee will have a check book in hand. The Cityscape Global Conference, which is held as a precursor event at the Conrad Hotel on September 10, is a fantastic opportunity to gain a high level of understanding of the factors shaping the industry. This conference always forms part of my preparation for the exhibition and I always recommend that my investor clients avail themselves of this tremendous knowledge sharing opportunity. The developers who do well out of Cityscape are those who utilize the event as a part of an overall “go to market” strategy. Prior preparation of at least 12 months in will increase the chances of maximizing the returns from participating in the event. So, for those of us with a passion for the industry, it is going to be an exciting three days. It always seems to end too early!